Not for the religious: or at least, not for the religious who can’t stand hearing a good bit of what is probably blasphemy. Show starts in 30 minutes, and of course I’ll put up the link to the podcast afterwards, when it is all said and done and all the wine has been drunk! This week: EP 267 :: a secular Maundy Thursday supper to cater for all of y’all Easter needs! For anyone new – the DJ is my darling dear hubby, known here as iDJ. He’s been doing this show for over five years now, and knows his stuff! He also does a new poster every week, and since the show is on Thursday, this year his theme has been throwbacks. Gotta love this one, on his confirmation day (he gave the name back a few years ago). 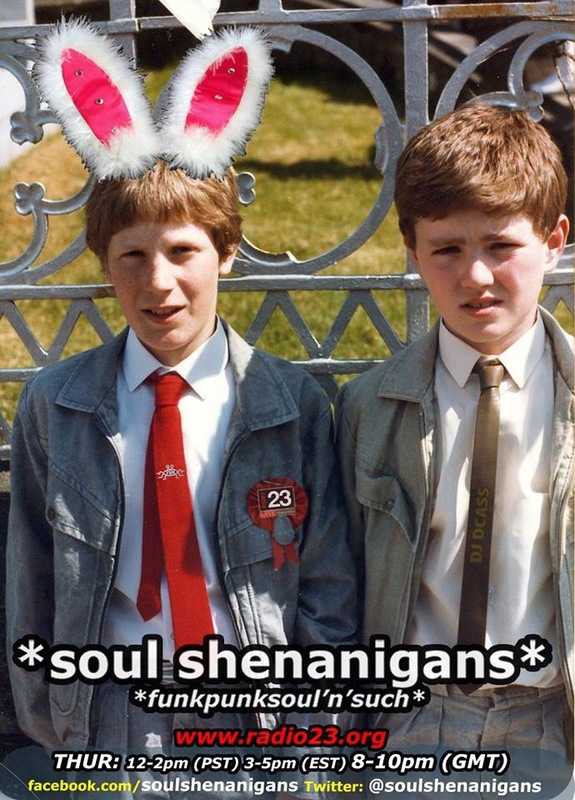 Podcast/playlist: http://soulshenanigans.podomatic.com/entry/2014-04-17T15_37_58-07_00 . Can either stream it, or download it. Final line of best version of the Passion story I ever heard told. Happy Easter. Hahahaha! If you can bear to listen to the show, you’ll get a few more! It’s always an opportunity for an ex-Catholic in a country that ‘claims’ to be secular, but won’t allow alcohol sales on Good Friday. And gives everyone a paid holiday day, too. I’ll be working, but I get an extra day off because of it. Yeahhhhh, secular, right. I work this Friday (only in the morning, like all Fridays), but have Monday off, which is just fine with me. One day to relax from the weekend. Most people have Friday though, and many have both (including students and government employees). We sell alcohol all weekend. Our chain has a special for this weekend, actually. I shall have this one play a lot in he car this weekend. It’s incredible how much I will have to drive in just a 3-day weekend. Well, imagine me hollering along during Leper Messiah – I’m a huge Metallica fan and had to go up and hear it loud! He’s working on it now! I’m going to bed. So far – yes! I went over my four-beer limit up to six, and I’m on to the rum n Pepsi now! Gawd bless a three-day-weekend! Ok, it’s not playing. But I will need a listen!